Yesterday's plan changed, since I wound up going to TriSwim. I did grab a small slice of meatloaf before I left to tide me over and after swim some of us headed to Chick-Fil-A and I grabbed their chargrilled chicken and fruit salad. Not bad for 22 g of Protein and 210 Calories. As usual though, the "light" berry balsamic dressing was 130 Cals for the packet. It's a good sized salad... I used the whole darned thing and it wasn't very good. Super-duper sweet!!! Would do the salad again, but not the dressing. 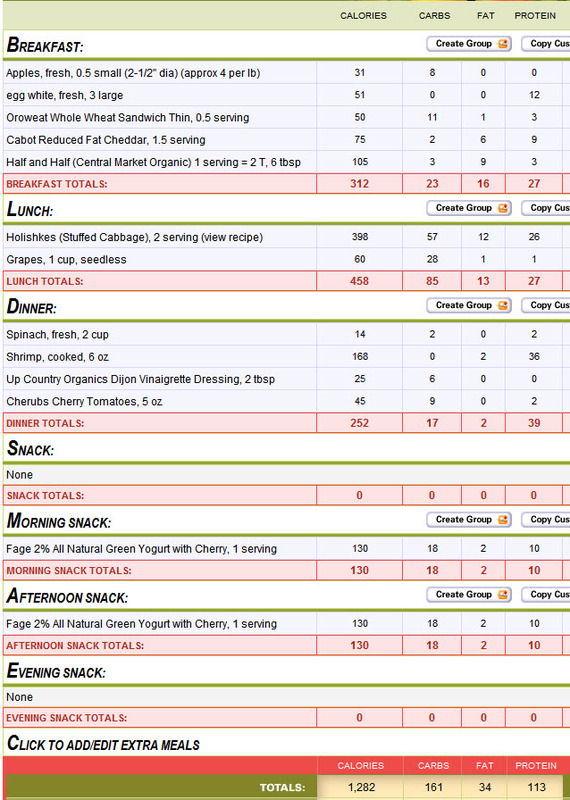 Still ended yesterday with 1,310 Calories, 131 g. Carbs, 37 g Fat and 122 g of protein. I was a super-duper good protein girl! Here's the plan for today... boss brought me some leftover stuffed cabbage from their Passover Seder. I haven't had good stuffed cabbage like that since my Gram was alive! Yum! I may or may not take a 1 hour run tonight. Feeling like I should with a 160+g of carbs for the day.